Goat milk has been used for centuries for shiny healthy hair. The low pH level of goat milk is close to our skin’s pH, making it a very gentle and superb scalp cleanser and hair conditioner. My shampoo bars contain pure fresh goat milk from my own goats. They do not contain any fillers or preservatives – just pure natural goodness for your scalp and hair. 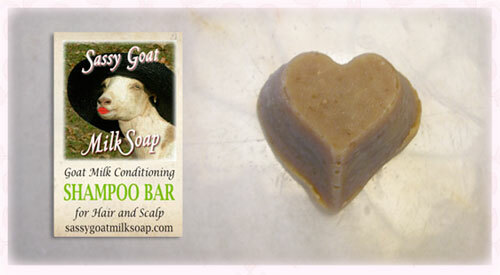 You will be able to tell an immediate difference when using Sassy Goat Milk Conditioning Shampoo Bars. Sassy Goat Milk Soap Conditioning Unscented Shampoo Bar contain these pure and natural ingredients: 100% fresh LaMancha goat milk and saponified Olive Oil, Coconut Oil, Safflower Oil, and Castor Oil. Sold out. Available late April, 2019. My conditioning shampoo bars weigh approximately 3 ounces. Conditioning Shampoo bars weigh approximately 3-ounces at the time they are handcrafted. Some shampoos may weigh slightly less as they continue to cure. Keep well drained to extend the life of your bar of shampoo.